Virteacon: Auto-rickshaw tariffs - Based on what? Auto-rickshaw tariffs - Based on what? I've not been blogging on lately, maybe I'm saturated with this world. But this does not stop me from thinking, and this thought sprung the blogger in me. I've been travelling quite a lot in the past 6 months, and the one thing that effected me the most was Travel expenses. The variations are huge, along with the attitude. Seriously guys, these Auto-rickshaw guys put the first impression of a city on us, right? This article is not a detailed analysis on how tariffs vary with region, but just a note on how my experience at different places were. To begin with, let me check the tariffs of my hometown - Kanhangad(Kasargod, Kerala). To travel from my home to railway station, it costs close to Rs.35(I'm not sure how much it is now, haven't been there for a while). This tariff is for a distance of 4-5 kms. There was a time when I thought this amount was huge, but no more. In fact there were easier ways to get to the town, you could always get "return autos" at a mere tariff of Rs.5 to travel the same distance. I guess the rates are almost same at the areas around there as well. Now getting on to a city - Kochi, Kerala. Railway station to my Uncle's house at Kaloor was the most frequent travel I made in auto. 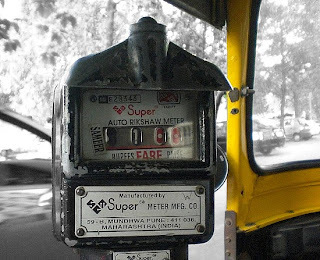 The problem was I used to reach station at 4-5 am, making it an Auto Driver's paradise to put up tariffs. Eventhough the distance was a single Km, they would put a label of a minimum Rs.50. We had to give the amount, without a choice. Now with Prepaid Taxi counter at the station, things are getting better. But still, I do think the prices at Kochi are pretty decent. Its around Rs.10 per Km. The journey from Kakkanad to Kaloor used to cost Rs.100(around 10 kms). And once I made a wild choice to take an auto from the Airport to Kakkanad(close to 23 Kms), and they demanded an outright amount of Rs.230. Now getting to the next city - Bangalore. I should say Bangalore has the highest Rickshaw tariffs. Bus travel is the best suited in this city, with lots of AC Volvo buses(Read this awesome experience I had - Tablets with Wi-Fi in Bangalore Volvo Buses!) around - it would be the best means of travel. I've not used Rickshaw a lot for travelling in this city, but I had to make a trip recently. I had to get to the railway station from Madiwala(close to 10 kms), and as I did not know where to board a bus, I opted a rickshaw. The worst thing was the Rickshaw drivers were behaving as we were a prey to be pounced on. Even before I got down the bus I came to Madiwala, the door was blocked by a bunch of Auto drivers trying to catch their prey. I politely said No to many, till I finally asked the fare. He said Rs.200, I rejected it. Then I knew that I should'nt have asked the fare over there. A few Auto drivers started swarming me. Then a Rickshaw stopped besides me and said just give the Meter charge + 50%(i.e., if the meter shows 50, then pay 75). I said OK, without knowing it was a trap. The meter was running as if it was on fire. And in no time it touched Rs.100. I had to pay a total of Rs.180, which would be the first and last experience in an auto at Bangalore. I have a few friends at Hyderabad and Chennai, and I've been to Hyderabad a couple of times. These places have the cheapest tariffs. Even if the Rickshaw driver says Rs.40 for a 6 Km drive, you can bargain if for even Rs.20. I've heard Chennai has cheap tariffs as well. All I have to say, Auto Rickshaws have a prominent place in India's means of travel. It puts a first impression on the city. Even if the Tariffs might not effect much, their attitude does. I wish we had a mechanism for Uniform Tariffs all over India, and a mandatory set of rules for them. I also wish we had a clear set of rules for Kochi Private Bus Drivers. The way they drive, is just too rash. To share a tragedy they caused, take a look at this video. Lets hope for a better future, a safe one. Windows 7 wont Boot? Its easy to repair!